Our biggest industry in Wisconsin is tourism. One of the reasons is because a bunch of people come to Green Bay every year for Green Bay Packer games. Downtown Green Bay is an area usually missed by football tourists, but if you’re also a craft beer lover, you should make the quick drive over. One of the treasures downtown is Hinterland Brewery. Hinterland Brewery also distributes locally, so it’s a great thing to pick up and bring home. First – if you’re thinking of having dinner here, be prepared to pay a little more. If you’re super hungry for a good bear and a big greasy cheeseburger, this isn’t the place. They have a lot of reasonably portioned, well crafted, locally grown food. So if you want to go somewhere where you’re sure to try some new, creatively put together food, this is the spot for you. But I am more concerned with the beer. 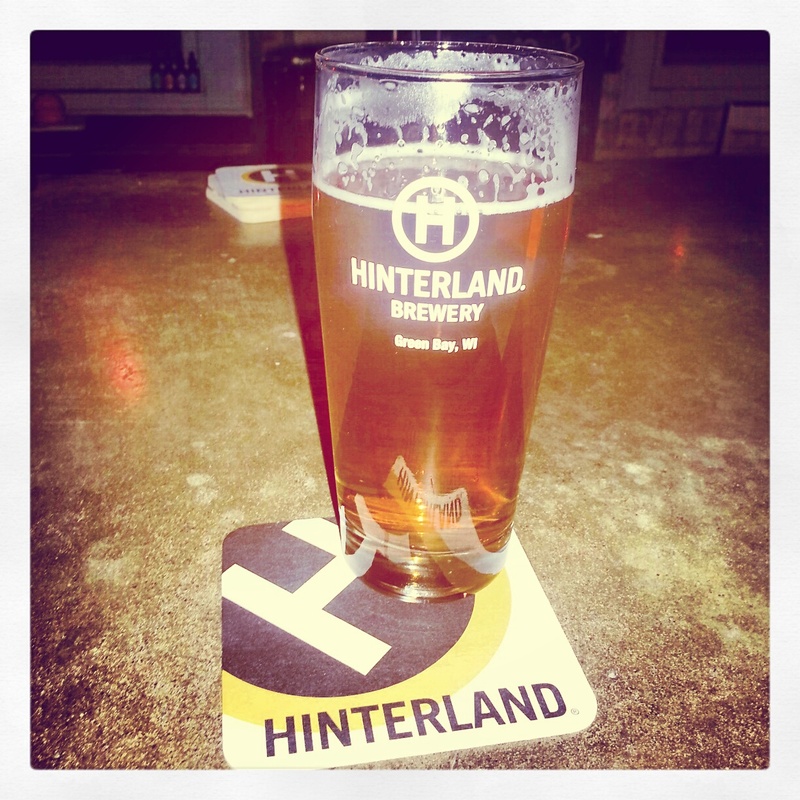 True to form, I started out with their Pale Ale – the go to beer at Hinterland. It tastes and smells grainy & floral toned hops. I loved this one because the texture was really unique. I felt like I could feel the grain on my tongue when I was drinking it & it gave my beer a really fresh edge. The Pale Ale is a medium weight & is a great start to the night at 5.3% ABV. Another staple at Hinterland is their Luna Stout. This stout is medium weight and goes down super smooth. This is a perfect fit if you’re a creamy coffee lover. If you don’t like coffee – don’t get this. Like most stout – this comes best after dinner, but you honestly could have it any time. By far & away in my mind, the best year- round- beer at Hinterland is their Amber Ale. First I should point out that a lot of times when you go to a brew pub & order “The Amber,” you’re getting a lager. This is ale. In a nutshell, ales are more flavorful because they are brewed differently and often use more ingredients. So this Amber is heavier than you might expect and has a strong roasty – piney flavor, & even has a hint of a sweet after taste. This is a must have if you’re in Green Bay. I want to mention quick just two seasonal beers. First is the Cherry Wheat. If you’re overwhelmed by the ales and stouts are a dark, scary thing to you, the cherry wheat can be a safe space. It’s a clean, crisp, wheat beer that doesn’t overdo it – and obviously have hints of sour Door County Cherry. Door County Cherries are famous here – and they make just about cherry everything up there. If you’re in Wisconsin for a while and making your way to Door County – you’ll know Shipwrecked in Egg Harbor also makes cherry wheat. Hinterland’s is better. In honor of the 40-50 degree difference between the weather now, and this time last year I want to mention the Winterland seasonal. The winterland is medium weight with a full malty flavor – but what makes it special is the tart juniper berry aftertaste. It’s a great beer for the end of your night. I should also mention if you’re coming here with non-beer lovers, there’s a good selection of wine & scotch here too – so everyone should have a great time! The last thing to point out is that the staff here is good. They know their beer, and they know their menu. They’ll be able to walk you through your beer and food choices successfully. They’re also smart. I haven’t had a trip to hinterland without having a conversation with the staff about current events, and NPR radio show, or how Green Bay is working to rebuild its downtown area. Overall – I’d rate this place a 9/10 on the awesome scale. Hope you all can make a trip here after the next Packer game! Last week I had a great time visiting some of my friends in Washington DC. Naturally I wanted to visit a brewery. Most breweries were only open for tours on Saturday, but Capitol City Brewery has a restaurant right downtown where I could get dinner and a couple beers. If you go to this place during happy hour on a weekday – it will probably be crowded and loud. The plus side is that it’s because appetizers are cheaper during happy hour. The place is also big enough to accommodate it. We were told our wait would be 20 minutes and we only waited about 5. We sat down at our table, and our server promptly brought us one of those appetizers everyone gets. But here it’s not chips, salsa, or bread; it’s totally pretzels and mustard… which is awesome, & obviously respectable for every brew pub. If I find one without pretzels available on the menu from now on, you will hear about it. The first beer I tried was their Pale Rider Pale Ale. If you like Pale Ale or IPA, do not order this. It has the usual Pale Ale medium weight, but just no flavor and no complexity at all. I usually like to let you know what food to have with your beer, or if you should have it before, after, or during dinner. If you have to have the Pale Ale for yourself, please just order it during dinner so that at least you have your food to eat between sips. After finishing my Pale Ale as quickly as possible I tried their Prohibition Porter. It was a lot lighter than I expected but it has a creamy oatmeal malty flavor. You could totally have this for a beer during or after dinner. I wouldn’t recommend it be your first beer. After the porter, I asked out waiter what their best beer was – he said he didn’t drink beer, like at all. He didn’t like it. I ordered the Rye Saison with no help from that guy. It was good: Hoppy, grape fruity, and full. It tasted exactly like I expected. It was a blessing a curse – nothing terrible, but nothing creative. On a scale from “Beer I drink in a College Basement” to “Creative Small town Wisconsin Brewery,” it’s a 5, or C, meaning it’s entirely average at all counts. If you’re going to DC, there are lots of pubs that have great beer selections of beer made in other parts of the county; I would check out those. *This seems obvious, but a lot of tourists take pictures in front of the Capitol Building and caption them “I’m at the White House!” They’re not. Just make sure you know the difference so you don’t embarrass yourself. Want to start beer tasting & learning more? I have the place for you. Titletown Brewery is more than a brew pub… it’s become a neighborhood hot spot in Green Bay. Whether you’re a veteran beer lover, taster, & enthusiast, or… usually drink Bud Light in someone’s basement, there is a spot for at the bar, and better beer for you to try. I’d like to share a couple of my personal favorites at Titletown, and start with the beers that won’t overwhelm you if you’re just starting to learn about the amazing world of beer. I have two go – to beers at Titletown. The first is the Johnny “Blood” Red. This is a tried & true Irish Red Ale that has just a tad more of a roasted taste than usual. It’s a great starter if you’re out for dinner, because it’s not quite light – but by no means heavy & you’re sure to finish it before your meal arrives in time to order yourself a beer to have with dinner. My second go – to beer, as an IPA lover, is the Green 19 IPA. Number one, it smells great. It’s all around a great introduction to IPAs as it pretty medium all the way around on intensity. It has a clean floral – citrusy taste with medium hop bitterness. If it’s too much for you – call me a hop head and be upset. The next beer to highlight is their Bamberg Brew which the menu describes as a “Smoked Oktoberfest Style Amber Lager.” Obviously that’s a long title, so let me simplify. I tried it and immediately thereafter said “This tastes like bacon.” Try it. If you’re a beginner and scared of darker beer – go ahead and try the ZizaniAle – it’s a brown ale with an ounce of wild rice per pint. I absolutely loved it. Dark doesn’t mean heavy – and this one is light, smooth, full of smoky flavor, and goes down nicely. It’s a great beer to eat with the beer cheese fondue (that you should totally order), because it will quench your thirst and keep you feeling fresh without sacrificing taste. If you pop in during the next few weeks – you’ll for sure see signs for the Perle Pale Ale. In Wisconsin, we like our creative hop blends, but this beer is brewed with 100% Perle hops that have a minty –spicy flavor giving it clean, crisp, full taste. It’s also a bit smoother than your average Pale Ale. This Pale Ale is worth a try, and a great beer to grab a growler to go & take home to family & friends. It’s hard not to like. *Titletown refers to the title of Green Bay, WI being Titletown, USA as they won the first Super Bowl, and the Super Bowl Trophy is named the Lombardi Trophy. I know there are a few other cities that feel like they deserve the title based upon accomplishments in recent years. If you’re one of those believers, don’t bring it up while you’re in Green Bay unless you want a history lesson about the greatness of our city, our team, their fans, and our all- around awesome spirit for and unparalleled dedication to the Green Bay Packers.